Blocked videos are one of the most annoying but most common issues in today’s online world. From region restrictions to copyright restrictions the online world is a minefield of blocked videos and restrictions aimed at stopping you from watching the content you want to watch. The good news is there is a really simple method to bypass such blocks and unblock videos that are blocked in your country. If you’ve got the annoying message “this video is not available in your country” on sites like Youtube or you’ve tried to access TV services from another country such as BBC iPlayer and been blocked then I know your pain. Thankfully all you need to do is use a service called a VPN or to give it its full name, a Virtual Private Network. A VPN is piece of software for your computer or app for your phone. A VPN allows you to route your internet connection to another location or even another country. By doing so you can avoid region restrictions which block you from viewing and other types of restrictions that block videos. Download the Windows or Mac software from the Apps area. Install, run it and log in. Select a country other than your own in the bottom right-hand corner. Once you’ve connected just visit the website with the blocked video and instead of being blocked you’ll be able to watch. If the video is intended for a specific country then you’ll need to connect to that country with IPVanish. For example if you want to watch BBC iPlayer then you’ll need to connect to the United Kingdom. Take a look at the quick example video below which shows how easy it is to connect with IPVanish on a computer. Sign-up to their monthly or yearly plan. 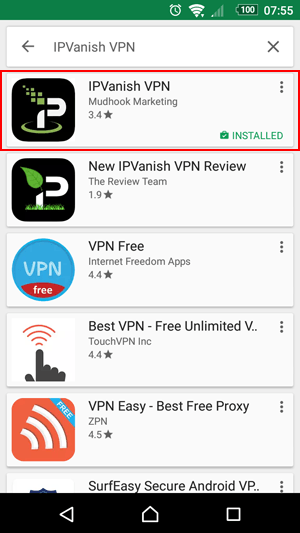 Search: IPVanish VPN or use this download link. Click on the IPVanish app and Install. Run the app and log in when required. Press on Country and select a country. That’s all there is to it. You can now launch your mobile browser or video streaming app and watch blocked videos from anywhere in the world. It’s worth remembering that some commercial streaming services can sometimes require location services (GPS) to be enabled which would stop you from viewing. To unblock blocked videos on your Apple iOS device such as an iPhone or iPad follow the instructions below. Visit the Apple app store. Search: IPVanish or use this download link. Click on the IPVanish iOS app and Install. Launch the app and log in when required. Once the app has connected you can visit the video streaming website of your choice or launch the video streaming app. You can now unblock blocked videos on your Apple iPhone, iPad or other Apple device. IPVanish is our top rated VPN service and has won our Editor’s Choice award for the past two years making them our recommended choice. However, there are other alternative VPN services out there too. Not all VPN services are suitable for unblocking video because their speeds are too slow to stream video which will result in buffering or bad quality playback. If you want to check out some alternative VPN services then we recommend taking a look at ExpressVPN and StrongVPN who both offer good services suitable for unblocking video.